The John Smith's Pock 7s - Yorkshire’s oldest and biggest sevens tournament - has grown from small beginnings into a special rugby day out that draws teams and spectators from throughout Britain to pack into Pocklington Rugby Club for more than six hours of non-stop rugby action and socializing every Good Friday afternoon. The first Pock 7 was quite parochial, with eight teams battling it out for a barrel of beer. The first event's final was eventually contested by a Goole side, that included a couple of men who worked in Pocklington, and a St John’s College Old Boys team. Goole won, and Pocklington’s Good Friday tradition was sealed. In those early days there was virtually no sport of any kind on Good Friday, and news of the Pock 7s soon spread as the event kicked off the Easter sporting weekend and became an annual reunion for people with Pocklington connections. During the 1960s and 70s there were numerous club sevens tournaments across Yorkshire, some of them bigger than Pocklington. But Good Friday seemed to be the perfect day, the event developed a unique atmosphere that no one wanted to miss, and with the excellent organization of club members, the Pock 7s flourished and went from strength to strength, while many other similar events fell by the wayside. Pocklington School won in 1960, while Headingley – the forerunner of Leeds Carnegie and at that time the north’s top club - were winners in year three. The traditional barrel of beer for the winners was proving to be less successful, and often ended barely drinkable, so the club was soon looking for a more fitting trophy for the winners. The club's tennis section was on the wane so the tennis championship cup was re-engraved to begin a new life. 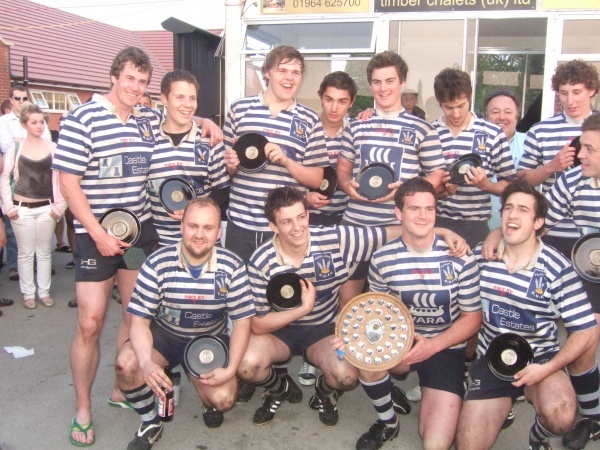 Ever since the WS Fowler Challenge Trophy has been the highly prized reward for the Pock 7s winners. A format was developed that accommodated up to 24 teams in a knock out tournament, with a Plate Competition added later for first game losers. While the Pock 7s was particularly popular with local clubs, it also became the perfect way for clubs from further afield to get their Easter tours underway, and in 1966 Stockwood Park, from Luton, became the first of several out -of-county touring sides to lift the trophy. The Pock 7s has been blessed with many afternoons of sunshine, but even inclement weather has failed to keep people away - including in 1974 when four inches of snow fell on the night before. While the club has always held on to the traditional elements of the day, some innovations have been welcomed, including a mini women’s sevens challenge at the start of the day and a computerized scoreboard. Some clubs have regularly sent sides with no real ambition or intention of winning, or even getting through the first round - they were just there for the socializing. But the standard of sevens rugby has also improved immeasurably through the years - sometimes due to sevens specialist and invitation teams entering, and sometimes from clubs including top quality players in the lineups. Flying wing, Mike Harrison, who captained England in the first Rugby World Cup, was in the Wakefield side that won successive titles in 1994 and 1995, while British Lions legends Peter Winterbottom and John Bentley are amongst numerous full and sevens internationals to have played in the event. The most recent player to appear at the Pock 7s and go on to the highest level is Wales and Lions wing Alex Cuthbert. The cosmopolitan flavour of the day has been enhanced in recent years as a number of South Sea island sevens’ specialists bringing their unique skills to the day, and in 2009 the trophy went to the Covenant Brothers RFC from Fiji – the team being made up of Fijians currently serving in the army in Britain. The list of winners contains an even mix of big clubs - such as Newcastle Falcons, Otley and Blackheath - along with local sides and the occasional touring or invitation team. The celebrities that have played in the Pock 7s over the years include actor Ralph Ineson, of ‘Harry Potter’ and ‘The Office’ fame, and BBC news reporter Al Leithead, who led Northern to a Plate success in 2001. The draw for the Pock 7s has also seen some of the game’s top names support the event in recent times. All Black legend Va’aiga Tuigamala and ex-England fly half Rob Andrew performed the honours in the mid-1990s. England star Jonny Wilkinson - whose father, Phil, captained Pocklington School’s team in the Pock 7s in the late 1960s - made the draw twice in 2000 and 2003, followed by his England World Cup winning teammates Martin Johnson, Neil Back, Andy Gomarsall and Iain Balshaw. French captain, Raphael Ibanez, has also done the honours and made the draw. In the past couple of years the England 7s captain, Rob Vickerman, has pulled out the names. As the host club, Pocklington made several gallant attempts at the title. But more often than not, Pocklington flattered to deceive and went out early on, until it finally came right for them in 1996. The club’s then player coach and Welsh international, Gary Pearce, was a noted sevens playmaker who had been in the Barbarians side that had won the Hong Kong Sevens a decade earlier. And he led the hosts to their first Pock 7s title after 38 years of trying. And Pocklington did it again two years later when they beat favourites and holders, Newcastle Falcons’ academy side, in the rain to once more lift the Fowler Trophy. The Pock 7s is a focal point for the local rugby fraternity, but especially for those with Pocklington connections. Former players, or Pocklington folk who have left the area, know they will always meet up with friends and teammates on Good Friday. And the touchline always contains clusters of Pock players from down the decades who have travelled the length and breadth of Britain to be there, while several fly back from their new homes abroad just to be at the Pock 7s. But it is not only Pocklington people who hold the Pock 7s in such high esteem. Numerous other clubs would love to be able to replicate the event, and numerous first time visitors are both surprised and delighted at what a well run and enjoyable day it is. Rugby journalist, Tony Curtis, summed it up after his first visit: “The Good Friday Pocklington Sevens certainly has it all. 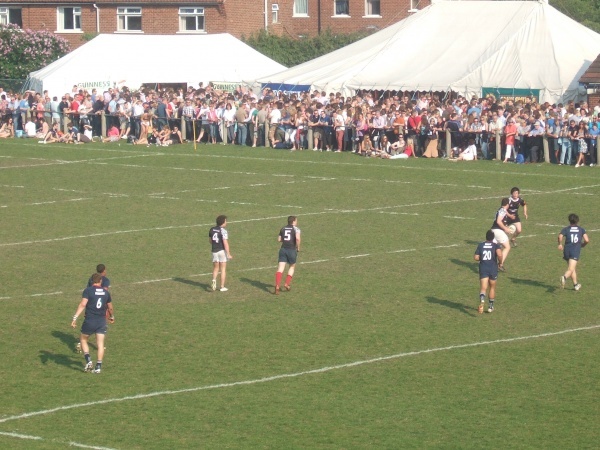 “With plenty of food, top quality rugby action and enough beer to sink a brewery, spectators from all across the country - and seemingly all of Pocklington - descended on Percy Road for the county’s premier sevens tournament.